The PEN Ten is PEN America’s biweekly interview series curated by Lauren Cerand. This week Lauren talks to Roxana Robinson, whose most recent novel, Sparta, has been praised for its sensitivity and nuance in exploring the experience of a soldier’s return home. She was lauded for a similar achievement in writing about the toll drug addiction takes on a family in her previous novel, Cost. 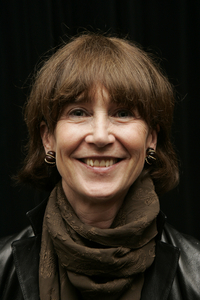 An active and engaged literary citizen, Robinson is the new president of the Authors Guild, which will honor Joyce Carol Oates for her service to the community at an annual dinner on May 20. It would be no fun to steal without attribution, but some books I wish I’d written are Disgrace, by JM Coetzee, which is brilliant and terrifying, and Transit of Venus by Shirley Hazzard, which is one of the most beautifully-wrought books I know. Also Loving, by Henry Green. Of course you couldn’t steal a semi-colon from Henry Green without revealing what you’d done, because his style is so dazzling and unmistakable. He strips away the architecture of writing and leaves you with the words, pressed, breathless, against your mind. My favorite place to write is somewhere where no one else is. I can’t stand hearing footsteps—in the hall, coming toward me, headed for my door. There they’ll pause, then I’ll hear the knock, or hear the door open and someone will say the fatal words, “Can I ask you something?” My favorite place to write is somewhere in the country, where no one knows I am. Up in the house in the woods, in my grandfather’s study, or up in the sleeping loft, or in a cabin without a phone at MacDowell. It’s hard enough for me to focus on what I’m doing in total silence, and when people start talking to me everything flies into bits. I don’t have WiFi. Instead I have a cable to connect me to the Internet, so I can unplug my computer and go to another room when I want to write. My favorite place to write is complete silence. That place. I have never been arrested, but when I was in college in Vermont, one night I was driving late at night with a friend. Her car ran out of gas on a lonely road that ran up through the mountains. A state trooper came by and picked us up, and drove us back to campus. I got in the back of the cruiser, and I saw the trooper’s big flat-brimmed hat lying on the ledge behind the seat. I decided to steal it. I was eighteen, and I thought of how cool it would be to wear that hat around on campus. The car was dark and I was alone there—was my friend in the front seat? I determined to swipe it. But the hat, though it wasn’t large, had a presence of its own. It was dark and heavy and precise, with its perfectly defined silhouette, the tall crown with the two impeccable dents, the flat wide brim, the narrow leather trim. As I thought about the theft I became gradually aware that the hat had a certain moral gravitas. It was like an invisible shield that repelled hostile advances. I kept telling myself I would grab it and slip it into my book-bag, but I did not. I told myself I’d wait until we got back, then swipe it as I slid off the seat, but as the campus grew closer and closer the hat grew heavier and more immovable. It grew weightier and darker until it became a presence that took command of the entire back seat. It now had a terrible heft, monitory and absolute. It lay exactly where the policeman had placed it on the ledge, evidence of his authority, the authority of the law. When we finally arrived at the college turnaround where the trooper dropped us off, and my friend and I thanked them for the ride and opened the doors to get out, I nearly shaded my eyes to avoid being seared by its dark glow as I slid past it. There are certain painters that I love. Maybe my favorite is the Italian Renaissance painter, Giovanni Bellini. He uses blue in a way no one else does, and his paintings stop time. They become something you can move inside. The death of someone close to me, on 9/11. It was both an impossible and necessary task. What the writer does is bear witness: we tell the stories of the things that disturb us most, and we try to tell them in the way that will disturb you most. All writers do this; it’s up to them to raise issues, ask questions, and call attention to things that must be addressed. Without writers, a society is silenced. Writers will always have a collective purpose: they record how it is to be alive, to be human. Writers are constantly examining everything: the life of the mind, the life of the emotions, the world, society, culture, science… Writers are the investigators and the interpreters of everything. Without writers, no one would know anything. People would still do things, of course. Scientists would keep making discoveries, musicians would create new harmonies, and dictators would go on locking people up, but no one would know about it. Writers create the web that connects the world. They tell us what we’re thinking and feeling. They tell us how the world is working and what it’s like to be in it. They allow us to live in a wider community—they create that community. There are lots of books that would be edifying—The Emigrants, or The Rings of Saturn, by WG Sebald, for example, or anything by Chekov—but the chances are that person wouldn’t read them. But if I could be sure he would read it—maybe Blindness, by Jose Saramago. It’s a terrifying view of a totalitarian state, and maybe it would remind him of what terror feels like, and what a writer can do. I think the line between observation and surveillance is determined by intention. Observation is a neutral act, without moral or political connotations. Surveillance is a hostile act, performed for the benefit of the watcher and to the detriment of the surveyed. Because technology seems to offer limitless possibilities for both, it’s important now to safeguard and protect the rights of the individual. Technology makes possible the surveillance of everything we do online. The information that’s collected is used for the benefit of the collector, not the observed. Information about us and content that we produce will be used by third parties for their own benefit—yet most of us choose to conduct many of our activities online. This is an issue that will be increasingly important, and we’ll need to find ways to protect our privacy and our intellectual property.